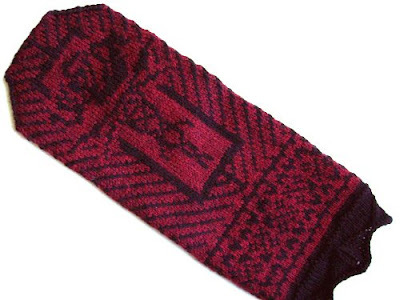 I'm beginning to think that I have a serous problem -- I can barely look at anything, be it textures, colours or any combination thereof without wondering how these elements woulds come together in a mitten. No shape, colour or texture is exempt from undergoing this process within my brain; it just happens. Moreover, I find myself stopping and considering the most unlikely of things, on the off-chance that they might prove to be the next somethings that I'll need to deal with. Take the simple act of doing the laundry. Dirty shirts go in the wash, clean ones come out. 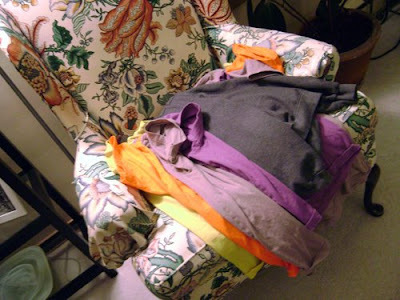 Those clean shirts end up on the chair in the front room waiting to be folded. It's time for me to pull myself away from whatever else I'm doing for some quality folding-time... ...and I freeze. I'm too busy staring at the colours on the chair, the random way in which the laundry was taken out of the basket and laid there, waiting to be put away. Clearly this needs to be properly documented before this fortuitous spectacle (or clean t-shirts, to the rest of the world,) is broken up and put into its dresser drawers! So, yes, I stood there and took pictures of my laundry. Allow me to warn you that if you do this the people you live with may look at you strangely (in some cases, more strangely. Anyway.) If this colour combination turns up in a mitten, please do not be terribly surprised -- my brain's already working away at this one. And speaking of mittens, because how can I not have a new mitten on the needles or freshly released these days, there's another one coming this weekend: This is Phèdre (Ravelry link.) She'll be out this weekend. You might recognize her from Jacqueline Carey's Legacy of Kushiel series. Please note -- I have not yet finished reading this series, so PLEASE, no spoilers from those of you who have, thanks! I'll let you all know the second the pattern's out, as usual. 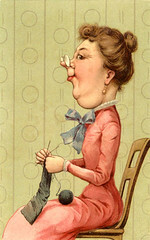 Now I'm off to go tackle another mitten...it truly never ends. Another lovely design & I love the red & black combination! October 10, 2008 at 9:47 p.m.
OK you MUST make mittens out of the laundry combo! I demand it! October 10, 2008 at 10:24 p.m.
Love as thou wilt, and I love that mitten! October 11, 2008 at 9:45 a.m.
October 13, 2008 at 10:48 a.m.